When we started with Remoters, almost 2 years ago, one of the goals we set was to promote remote work to become the new “standard” by helping professionals to find the perfect remote-based job and organizations looking to operate effectively in a distributed & location independent setting. To achieve this goal we’ve shared resources, interviews with remote professionals and organizations, digital nomads events & tools for remote work-, we have +40 interviews with remote based professionals and teams sharing their journey & tips for effective remote work. We have also developed functionalities to incentivize remote work, listing remote companies hiring remotely & remote jobs offers. We have created the largest list of companies hiring remotely in the world, with +500 companies featured in our Remote companies section, as well as aggregated remote jobs openings from main jobs portals, now also offering our own free remote jobs publishing option. Since we had read in the past how in the US the number of remote workers doubled over the past decade and 50% of people are expected to work remotely by 2020, it was not a surprise when we saw that 71,96% of the +500 companies hiring remotely in our website were from the US. Do Basecamp, Buffer, Zapier or Scribd sound familiar to you? These and many other well-known remote based companies with a team of people from all over the world are originally from the US. This is very smart for them as it allows them to hire the best possible professionals without a location constraint. It’s also the case of the UK, the second most important country with companies with a remote team in our database: 7,25% of the remote companies on our website are originally from the UK. In June 2014, there were 4.2 million home workers in Britain — 13.9% of the workforce. Also, according to another study, 91% of firms in Britain have at least one employee working from home, and 19% of companies claimed that they had over 50% of their employees working remotely. Although according to this study, you don’t have to be in software or technology to land a great remote job, we have great news if you are working it in: the reality is that in 2016 the top industry hiring remotely in our website was Information Technology with 29,2% of the jobs posted by companies from this particular field, with an additional 4.51% in Mobile App development. It’s one of the hottest industries, with companies growing and startups being established more than in any other at the moment. There’s also a shortage of highly skilled and experienced developers, especially in certain locations that can also be quite expensive. Web development or tech support can be completely executed online thanks to the nature of the jobs as well as already existing online based platforms. After technology, marketing is the second best industry for remote workers, with 24,51% of the remote jobs posted in our website being from this field, and it’s understandable with so many roles that can be fulfilled in marketing without a location constraint and completely online: from Content Writer to Social Media Manager, SEO or Digital Marketer. One of the questions we asked every single time in our +40 interviews with remote based professionals and teams was about the tools they used for effective and productive remote work. The tool that most of the remoters we’ve interviewed on our website said they use is Skype. Defined as the more well-established communication tool, Skype provides video, chat and voice call services for free. Since it was one of the first free tools in this field that continues delivering a reliable service, it doesn’t really surprise us that is so popular, being used by 56,25% of the interviewed remote working professionals. It was actually more surprising to see that Skype is closely followed by Slack, used by 45,83% of the interviewed remote professionals for communication and productivity tool. A relatively new player, Slack has certainly won a high share of users among remote based teams & professionals, not only due to its own “base group chat” organized in easy-to-set and searchable channels, but also with the added functionality of many add-ons that have been developed for it that allow to integrate it with so many other tools too. If you want to learn more about tools that facilitate remote work, check out our recent post about 22 remote work tools any digital nomad needs in 2017 or our tools section. When talking about the places remote professionals prefer to work from, 41,67% mentioned their home, which is a good reminder about how not all of the remote working professionals are digital nomads necessarily, but rather “location independent” who might want to work while traveling but also by living in the country, by the beach, near more family, etc. Home offices seem to offer the best environment to focus, gets a thing done and stay productive when you can work from wherever you want. The popularisation of coworkings can’t go unnoticed, though, since 37,5% of our respondents mentioned them as one of their favourite places to work from, especially when they look to interact with other remote professionals & organisations. After home & coworkings, coffee shops (27,08%), hotel rooms (10,42%) and rented apartments (10,42%) are mentioned as popular places to work from. The main challenge with coffee shops is what makes hotel rooms (during short-stays while travelling) and rented apartments (during long-term stays while travelling) hot places to work from: Internet connection. It’s still often a challenge -especially if you’re travelling abroad- to get a reliable (and safe) internet connection on the go, especially when you need to interact with other team members or clients through online calls. Another of the key questions we asked during our interviews with remote professionals and organisation was regarding the advantages they felt they had while being able to work from wherever they wanted, and for most them, there was no doubt that one of the biggest advantages of remote work was freedom (31.25%). When working remotely, you don’t only have the freedom to work from wherever you want but it usually also goes hands-to-hands with freedom with the overall work organization, like schedule flexibility; both of which end-up having a huge impact on the work-life balance, and general lifestyle of people, who perceive having so much freedom around their work environment: from where & when they work; making them much more happier with their life, as well as more productive. After and highly related to freedom, 27,08% of the remote professionals said it was flexibility the second-biggest advantage they had: The flexibility to organise their work to better match their lifestyle preferences or family needs. Additionally, besides freedom and flexibility, people consider they are more productive (25%) when they are offered the opportunity to work from wherever they want, which has been stated to be the third biggest advantage to working remotely. They said they could find the most productive environment for getting things done, to focus better while not being distracted as in the office. Other advantages of remote work given by our respondents were having a better family life (8,33%), getting to know other people and cultures (6,25%), saving time or money (6,25%) -avoiding commuting for professionals and having to rent or buy an office for organizations- or being more inspired (4,17%). Although remote work has many advantages, it might also have a few disadvantages too and we also asked about them: 29,17% of the respondents mentioned missing the social interaction as the biggest remote work disadvantage. When working remotely is harder to interact and socialise with other people, as when you go to work to an office on a day to day basis, you end-up socialising and making friends with your colleagues, as well as having the opportunity to interact more with people in general. “Extroverted” remote based professionals said they had chosen to work a few days a week from coworking spaces in order to avoid this issue. 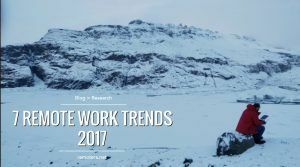 A consequence of the lack of social interaction, loneliness (14.58%), was the second most mentioned disadvantage of remote work. This doesn’t only happen when working from home but also when being away from your family and friends for those who are digital nomads. Other far less mentioned disadvantages of remote work were the lack of a routine or communication problems, for example. Nevertheless, there are 14,5% remoters who said that working remotely has absolutely no disadvantage or that there are so many advantages that the disadvantages don’t count. When we asked remote based professionals and companies about what they would say to those organizations that don’t believe in remote work to start considering as a way of work, they mentioned trust and confidence: Not giving employees the opportunity of working remotely indicates that companies don’t believe or trust necessarily in their abilities to organize themselves and get things done, as well as shows that there might serious issues in the way productivity is measured in the company (“if they need to see you physically at the office to know you’re really getting things done, there might be definitely an issue around productivity control”). The second most popular reason was reducing costs, for the companies on one hand, as there won’t be a need to rent or buy an office space which can be an expensive operative costs for any organization, as well as hiring in some location where it can be certainly harder and more expensive; and for the employees who won’t need to commute every day to be able to work, and therefore save that time and money they would spend on gas or transportation tickets. The third reason was “missing a lot of potential talent just because they don’t live in the same city“. Companies that require their team to physically work at their office every day might be missing of having more highly experienced and savvy professionals who could greatly contribute to the growth of the companies and become fantastic employees just because they don’t happen to live in the same place. As we can see, remote work has evolved so much in recent years, with so many advantages, tools, with people & organisation already making the most out of this opportunity, but there’s still a long way to go too. 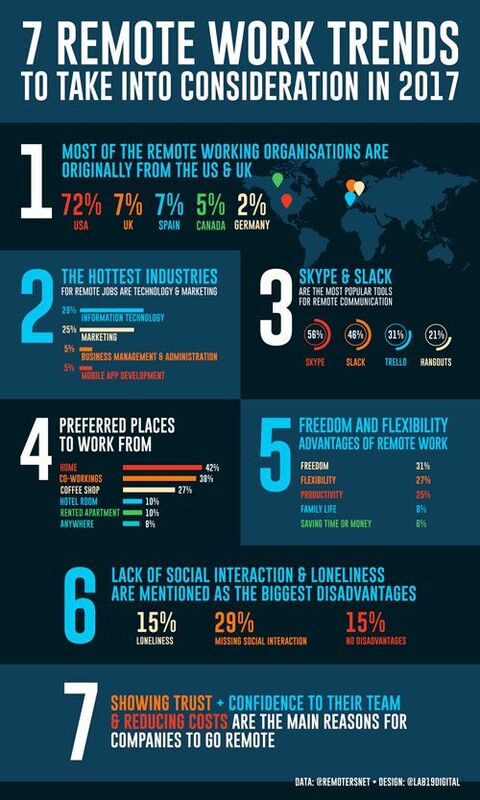 We hope that these remote work trends, advantages, disadvantages & reasons help professionals and organisations to take the plunge of start working remotely! If you also want to take a look at the +40 interviews we’ve done you can check them our here or if you want to look for your next remote work opportunity, take a look at our jobs section. What are your plans regarding remote work in 2017? Let us know in the comments! We want to share a very cool infographic for the post that we have received freely, made by https://lab19digital.com. Thank you very much for it! this is indeed a nice share & informative, we use offline data collection app that let’s you gather data from remote locations. The data gets synced to the server when the device gets automatically connected to the internet! This move has made many workers worry less about data accuracy and lets users examine the data in real time.